I have been using Visual studio since 2003 version and it's been decade and still my favorite editor. With visual studio 2010 they have introduced blue theme and With Visual Studio 2012 they also introduced a black theme. Lots of people are using lots of different themes. Some people like black themes and some does not. I had always argument with my friends about visual studio themes. So I thought it will be a good idea to get survey about themes and so what I have done is to put a survey on my blog. As you know this blog is technical blog so most of my readers will be developers. So far I have got a interesting data so I thought it will be a good idea to write a blog post and share those data with you. So till now I have got total 124 votes for my survey and here is the result of the survey till now. From, the above survey I get following fact. Lots of people like black themes out of 124 votes I got 49 for black themes. So black theme is most the popular one. To my surprise light theme comes second which I thought will be a third place but I got 39 votes for that. This survey is still open for the five days. So if you are new to this blog and still not cast your votes then its right time to do. If you need more customized colour themes than I request you to visit http://studiostyl.es/. It got thousand of customized colour themes. If you need more option than this three themes and then you should also try visual studio color theme editor extension. It's available from visual studio 2010. Here is the links for different visual studio versions color theme editor extensions. Once you install you will get lots of default color theme choice as well you can customize your theme and save it. Now it's time to write about my personal preferences. 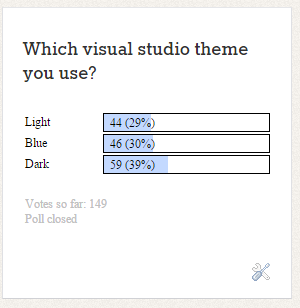 It totally depends on the lighting condition where I am using visual studio. If there a lots of light I prefer to use light theme while if it is dark then I like to have dark visual studio theme. Hope you like it. Stay tuned for more. Still this survey is open for next five days. Please do vote for your favorite themes. Here is the latest update for the survey, the survey are closed now and here is the final result. Clearly Black themes are more popular!. Why it's the right time to learn TypeScript.